I’m home now and all fired up! I arrived safely home to Clasheen this morning, tired, elated, fired up with the knowledge to put some ideas into practice and very satisfied after a wonderful week felting at Jeanette Sendler and Alison Mountain’s beautiful new studio ‘Big Cat Textiles’ in Scotland! The week was a huge success from many different points of view: the start of a wonderful season of summer schools for Big Cat in their new studio space, an amazing opportunity to learn from and be inspired by Dagmar Binder over the course of a 6 day masterclass (three dimensional structured surfaces for garments and wall hangings), felting and having fun with great friends Merridee and Susan from the U.S., being wined and dined by Merridee’s husband Keith who cooked great tasty food for us in the evenings and then kicked us back to the felting studio, spending creative time with old and new friends, learning techniques which I know will help me become a more professional felter and overall having such a fun time and creating some felt pieces that I’m actually very happy with!!!!! It was also lovely to meet Aileen Clarke and her friend Kirsty (fellow felters from Scotland! ), work alongside Britt (we met for the first time at ‘Felt in Focus’ 2009! ), spend time felting with Merridee, Susan, Linda and Jenny each night after supper, all in all it the week has definitely been one of the highlights of my felting career to date! When I got home Annette and Rex were both in great form. Today’s been spent relaxing, chatting, showing Annette the pieces I made at the workshop and planning a trip to visit Philip and Mary Cushen at Cushendale Woollen Mill before Annette heads home on Wednesday. My fingers and thumb pads are actually worn out now from all the rubbing and soapy water during the workshop (thanks Meridee for the Compeed plasters, brilliant!!!) so tomorrow is planned to be a work free relaxing day and I’ll get the chance to spend some more time chatting and showing off the beautiful rural locality surrounding Clasheen. I also hope to to catch up somewhat with emails and paperwork, forgive me if you’re waiting for a response to messages, mails or phone calls, concentrating and immersing myself in the total masterclass experience was essential!!! More pics tomorrow from the week as it progressed, I promise! Day two saw everyone moving to the Feltmakers Ireland studio in Phoenix Park for the morning session before heading back to Collins Barracks for the afternoon. Logistically this meant that we needed to bring all our relevant materials plus our work from day one with us. Because I had worked and felted my bag the previous evening I was free to start developing my theme further as well as have some time to absorb all we learnt on the first day. 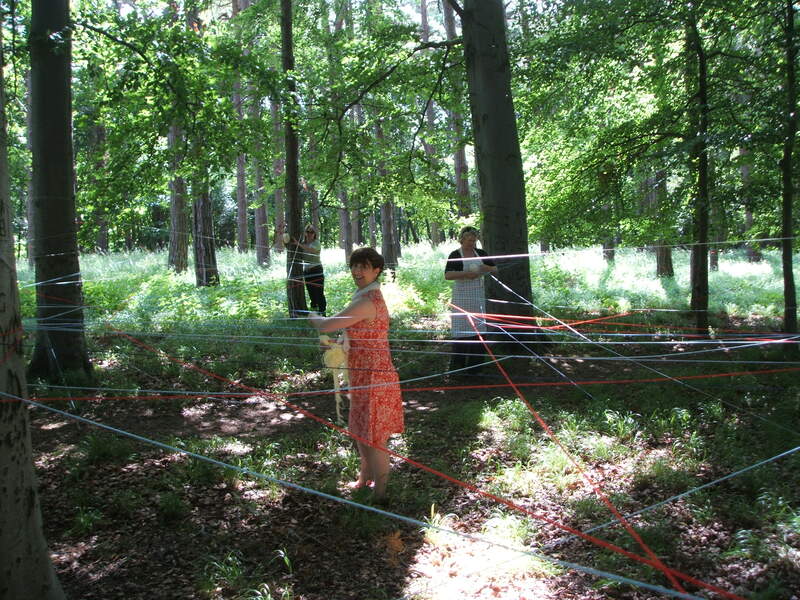 Annette had asked friend and workshop helper Cristina to bring some balls of cheap yarn with her and we started the day by having a fun session weaving the yarn through the trees. For anyone not familiar with Phoenix Park it is the largest park in a Capital city in Europe so we had plenty of trees to choose from!!! Jeanette suggested that we either allow ourselves to get lost in the weaving and just enjoy the moment or else contemplate the different ways we were all connecting and how the many strands ultimately conntected and became one big web. Needless to say this was great fun! Today I am going to show you two detailed images of my bag, the full bag will be revealed in the next post. 33 KTOG – ‘Knit TOGether’ group for North Hertfordshire. It is possible to submit your own blog to Wikio for inclusion and I think that it will be interesting to look through some of the above blogs whenever I get a free minute! Everyone was pretty tired and hungry at the end of day one and straight after the workshop finished a few of us went for a tasty Italian meal nearby with Jeanette. Refuled and ready to go again I drove straight back to Alan’s small Dublin pad and proceeded to lay out my surface design and felt my bag. As already mentioned I had made some provisional sketches giving ideas of where I wanted to position my silk fabric and flax fibres. It quickly became obvious to me that I needed to adjust the positioning slightly if I wanted to get a balanced and pleasing look once the resists were opened up and the other layers of design exposed. I spent quite a bit of time cutting around the edges of one of the flower motifs and some more time cutting out small splashes of red and grey silk which I laid out underneath some of the silver flax. If anyone is interested in ordering dyed flax I bought several different colours online from Filzrausch. The last descision I made was choosing to lay out three strips of the hand rolled edge of the scarf on the front of the bag, my design was now complete and I was ready to felt. Felting the bag did not take long at all. Because it had already been wetted out and left sitting in the trunk of my truck while I ate my food the wool fibres were nicely relaxed and everything came together very quickly, probably no more than 30 or 40 minutes rubbing and rolling in total! Even though I started the project with the intention of using less wool and having a slightly more ‘flexible’ bag than usual I still worked the wool firmly and finished when I was happy that plenty of shrinkage had occured. I was really happy with how the silk combined beautifully with the wool and almost melted into the front of the bag. 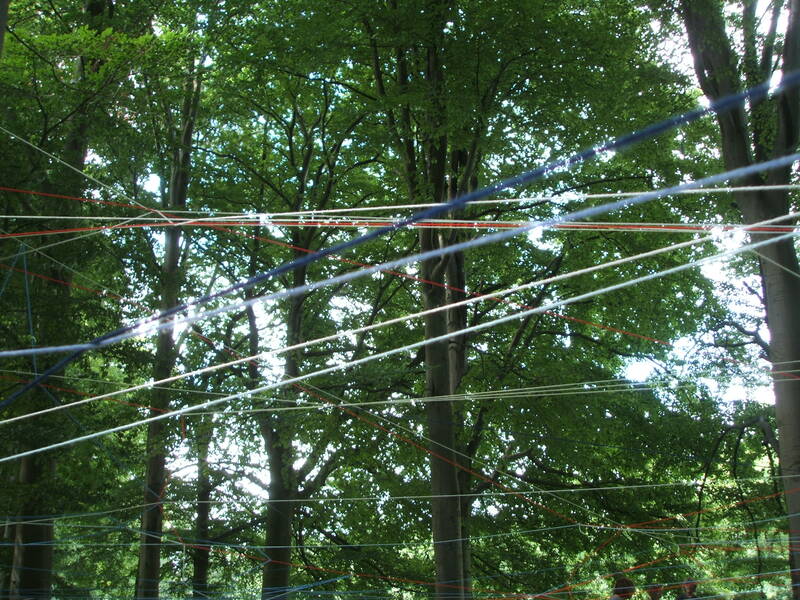 Next time I will post some pictures from the workshop and write about a wonderful exercise (with trees and yarn!!!) we all did outdoors at the start of day two! Thanks Dawn for giving me permission to publish your image here and I know that everyone will join me in saying congratulations. Triton’s Horn is a wonderful piece of felt and I am so looking forward to seeing it in reality when I visit Michigan this October! For those of you wondering why I have not been advertising dates as promised for my American workshops in September/October I have been having a few (read panicing here!) blips with finding out the correct info for my Visa application. At last I have the relevant data as of Friday morning and have been told I may travel under the Visa Waiver Programme providing I have some relevant letters with me to produce in case of questioning. Whew, that is a HUGE load off my mind and now I am going to contact all my great friends and co-organisers during this week to re-open talks about potential workshops and venues. You WILL be the first to read confirmed details here and as a little taster I can reveal that I will be facilitating a ‘Complex Felt Bag’ workshop on 25th and 26th September at The Tin Thimble in Loomis, CA and a ‘Nuno Mosaic’ workshop on 27th September, also in The Tin Thimble, another ‘Complex Felt Bag’ workshop on 11th and 12th October in Kalamazoo, Michigan and a ‘Felted Accessories’ workshop on 13th October, also in Michigan. San Fransisco and hopefully Berkeley workshops will take place between 29th September and approx 8th October with something special in the pipeline for World Felt Day on 2nd October, watch this space!!! Continuing on from yesterday, the next thing participants at Jeanette’s workshop did was sit down quietly for about 20 minutes to write down the thoughts and feelings evoked by talking about our objects and memories. At this stage we were also looking for a working title, this was not set in stone but could be ammended and adjusted through out the course of the process. Initially I jotted down ‘Isabella on my mind’ as a provisional title and by the end of the weekend decided to run with ‘In search of Isabella’ which I now hope to develop further into a body of work inspired by my grandmother and possibly other relatives in both Scotland and Ireland. 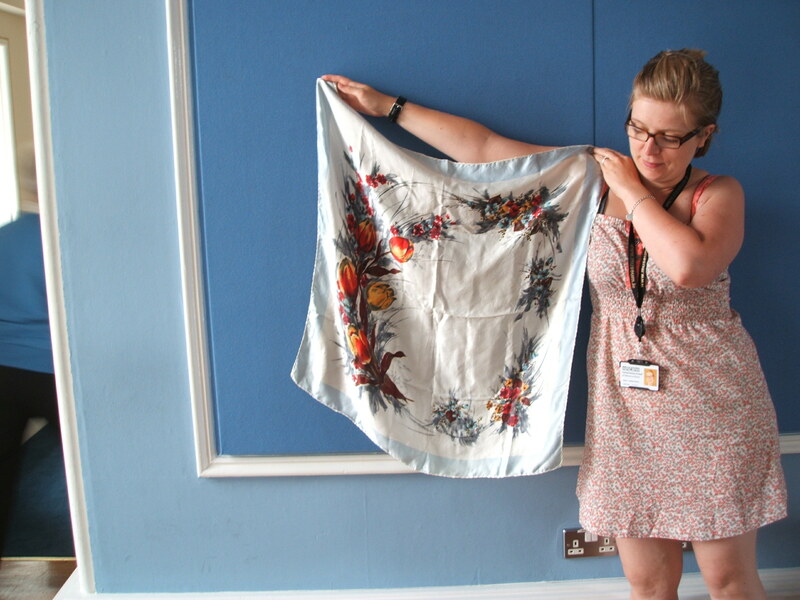 Although I had brought quite a selection of granny’s silk scarves with me the one pictured here being held by Natalie is the most evocative for me colourwise, therefore this is scarf that I choose to cut up and rework into a new piece. It was a very nervous moment for me cutting into the beautiful hand rolled silk but once Jeanette had encouraged me to wield the sissors all was well and I got stuck in with a good will. Because I had such strong memories of my grandmother and a clear idea of where I wanted to go it was not difficult to select a bag as the project I wanted to felt basing the shape on the little suede jewellery pouch of hers I had brought with me. I know that sampling can be a very important part of any project but because I have been working a lot recently on bags and inclusions I decided to jump straight in and cut out the template having already planned where I was going to use the various cut outs from the silk scarf. I wanted to use the largest flower motif intact in the inside of the bag and then nestle various pieces of silk within the wool before adding surface detail with more silk flowers and strips of the rolled edges. 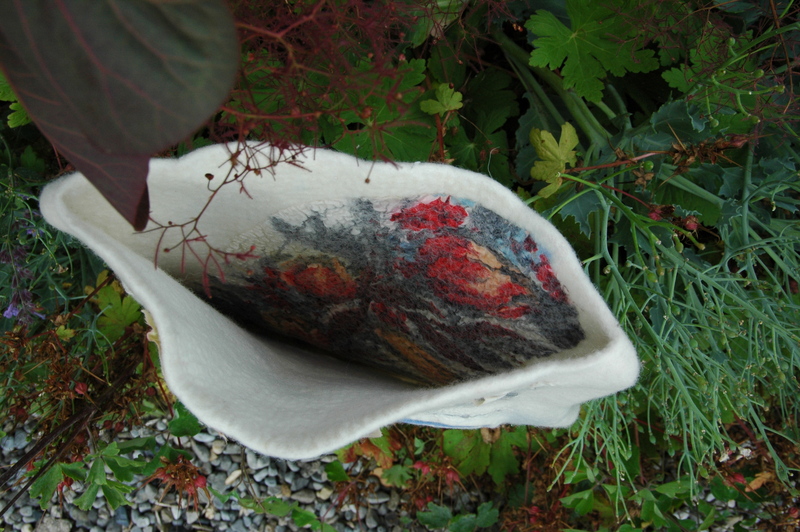 My idea was that the bag would be equally beautiful inside and outside, seen and unseen, and I was further going to embellish the surface with both raw and dyed flax (linen) fibres. To be cont ….. 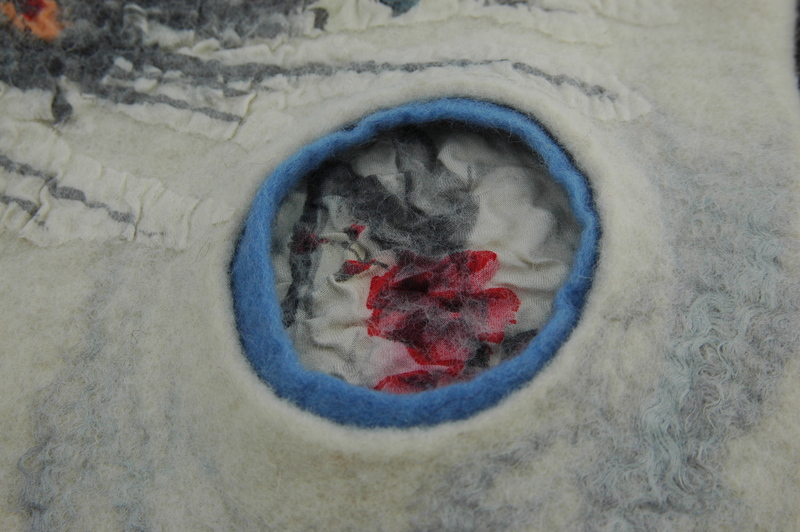 Preliminary report from an outstanding ‘Felt and Nostalgia’ workshop and congratulations Dawn! Over the next few days I am going to blog about the wonderful experience I had this weekend attending Jeanette Sendler’s ‘Felt and Nostalgia’ workshop in Dublin. Primarily I am going to be talking about the pieces I made myself and explain a little bit about the thoughts and emotions that went into selecting the shapes and inclusions that I worked with. To fully appreciate how thought provoking this experience was one would need to attend Jeanette’s workshop oneself and although I don’t want to give the impression that you will be learning here what I learnt over the last two days I do want to share with you how this experience will carry forward into my feltmaking in the future. We started our first day by talking about and examining how Jeanette incorporates items from the past into her felt and reworks them for others to enjoy in the future. We oohed and aahed over some of her beautiful work before sitting in a circle and brainstorming about putting our working concepts together. The items I finally selected to bring with me as a starting point for my work all related to my father’s mother Isabella Whitecross-Urquhart, a Scottish lady who ultimately moved with my Irish grandfather to Jersey via Ireland. They included some beautiful silk scarves, a brooch she often wore, the little suede pouch she stored a bracelet in and some dyed and undyed flax fibres. These fibres were relevant to me because Ella’s (her pet name although ‘pet’ is a relative term!!!) father was a linen merchant and I wanted to include reference to the linen business in both Ireland and Scotland. Everyone who wanted to spoke about their chosen items and the memories that they invoked, listened to and sharing stories was very moving and not something to share outside the group without express permission from the individuals. It did become clear to me however how much of my past is present in my every day life here in Ireland and that this is not necessarily the case with everybody, I am lucky. Maybe this is one explanation for the fact that members of my immediate family are very unemotional. Possibly it is because we carry the past around with us wherever we go and we don’t feel it necessary to talk about it or discuss it ever, it just is. Yesterday evening when I returned from the workshop (I had been intending to stay another night in Dublin but the Monday felting session I wanted to attend elsewhere had been cancelled) imagine my delight to discover on page 9 of the latest edition of ‘Felt Matters’ a beautiful picture and an article titled ‘Triton’s Horn’. This seemed to tie totally in to the idea of felt and nostalgia because Dawn had felted a wonderful conch (pronounced conk!) 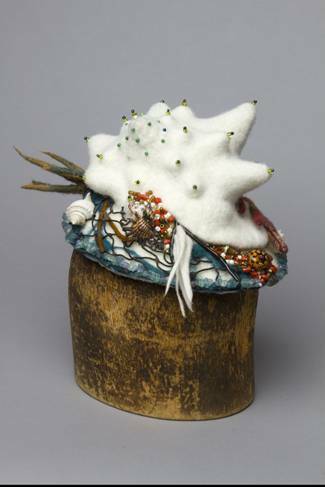 shaped hat inspired by memories of her uncle Tom and aunt Dot and actually felted initially around a conch shell which had belonged to her aunt! With Dawn’s permission I will post a picture of the beautiful creation here tomorrow but for those of you with access to the IFA’s magazine, check it out, you won’t be disappointed. Some exciting ‘felting’ time ahead this weekend! I have been fortunate enough to be one of the names drawn out of the hat to attend a Jeanette Sendler felting workshop this weekend! 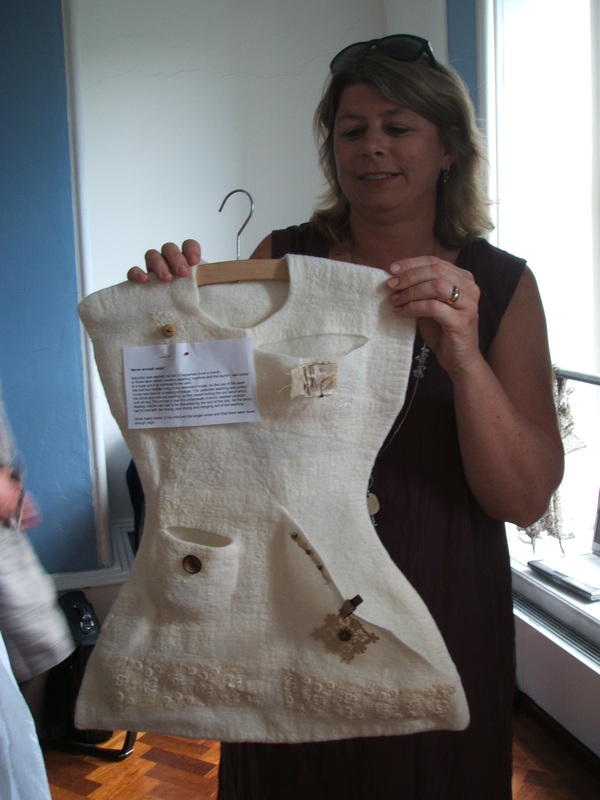 Organised by Feltmakers Ireland this is an exciting opportunity to learn how Jeannette works and explore the topic ‘Fibre, felt and nostalgia’ To grasp an idea of what we will be covering you can check out this post on the Feltmakers Ireland blog. I promise to report back about how the weekend went on Monday afternoon, no computer coverage until I get back to Carlow! This afternoon I am going to try and ‘tame’ my kitchen and get a few loads of washing dry before assembling all my materials in preparation for travelling tomorrow. Not sure yet what memory filled item I am going to bring with me to the workshop but hopefully it will hit me as I start to put all my pieces together. PS In case any of you are wondering Rex will be very well looked after by his old owner’s niece who here on a holiday for approx 10 days, perfect timing! !